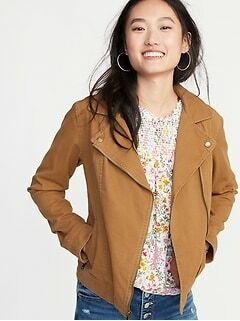 Effortlessly create standout looks wearing a cool and flattering moto jacket from Old Navy. 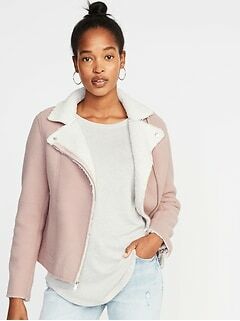 Give a statement twist to anything you wear with this season’s fashion edit of cute moto jackets that go the distance without setting back your budget. 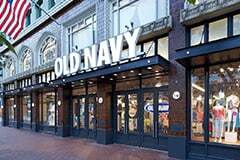 Old Navy offers the latest styles in these ultimate cool-girl pieces that boast an elevated take on a classic staple that will become your favorite way to layer in cooler weather. 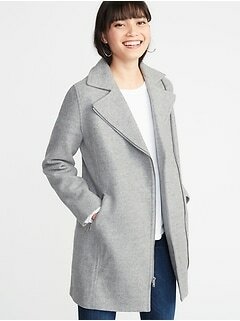 Explore the signature cropped and overall comfortably fitted structures that lend a streamlined and flattering silhouette. 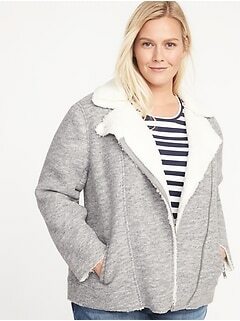 With eye-catching details such as vertical or asymmetrical zippered pockets or standing collars, they seamlessly blend sharp polish with a hint of understated rebellious attitude for an intriguing contrast. 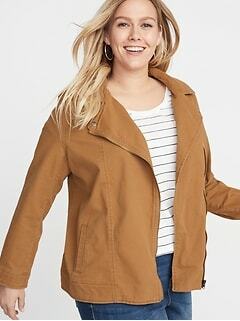 Cut from soft, machine washable fabrics in a variety of colors that are great for the season as well as super versatile to complement a variety of ensembles, you’ll feel like a confident fashionista the moment you slip into one. They’ll infuse a touch of edgy style into your everyday wardrobe that you’ll reach for constantly. 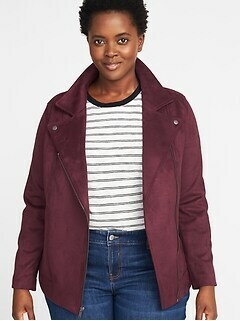 Fast track the season’s looks by elevating an outfit with a modern edge when wearing any of these sporty and sleek biker jackets from Old Navy. 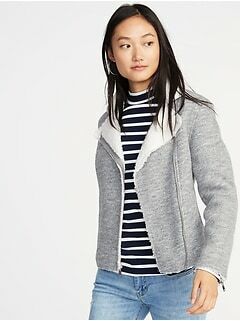 As timeless and effortlessly cool layers, they’re perfect to style with both day and evening looks that will add undeniable flair for casual as well as dressy occasions. Make a trendy statement on the weekends by pairing one with your favorite jeans and a tee for the ultimate casually cool ensemble. Add a bold touch of the unexpected by layering one over a girly dress for an evening out. Their slightly cropped silhouettes also look equally stylish over a flared or maxi skirt for a hip everyday outfit. Shop this all-American collection and embrace your inner rebel by finding your new go-to layer that embodies all of the cutting-edge details you’d expect this season. 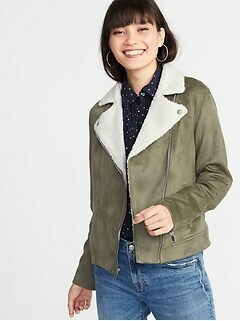 Discover the latest styles in affordable biker jackets at Old Navy that will instantly elevate your wardrobe to new heights.